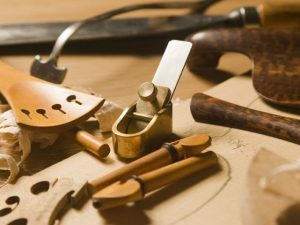 Martin’s violins are made following the method invented by Andrea Amati in the sixteenth Century and followed by the great Cremonese masters for over two hundred years. This method has been reconstructed or rediscovered by Geary Baese, whose willingness to teach and inspire Martin has resulted in violins which match ‘Golden Period’ violins for tone and playability. There is no magic potion or silver bullet involved in this method; it is logical, methodical, measurable and, once accepted, profund. The harmony of the system manifests itself in the harmony of the sound of the instrument. Martin says “I am privileged to understand this system, I certainly do not claim credit for its rediscovery but I do consider it my responsibility, in return for this extraordinary privilege, to offer instruments which embody the elegance and harmony which underpin the design of a genuine Cremonese violin.